BBB is not meant for tournament games or for casual, throw-the-toys-on-the-table games. It is meant for fighting historical battles. 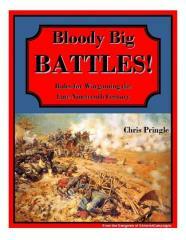 BBB and its companion volume, Bloody Big European Battles, therefore provide fully playtested scenarios for 25 of the most important battles of the period. Further free scenarios are also available on the web. All the scenarios fit the battles they depict into a beautiful, tightly engineered game structure. They have clear, simple, but carefully thought-out victory conditions, designed both to recreate the historical situation and to generate an exciting and balanced game that can be completed in a sensible period of time. A particular joy of fighting historical actions on this scale is that usually both sides have several different viable strategies available, meaning the scenarios are full of replay value and can produce quite different games each time.